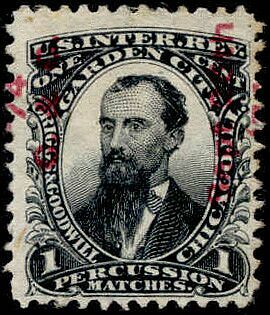 A number of match companies in Chicago used the L.G. Hunt die, with various modifications. Hunt's factory was known as the Garden City Match Manufactory, and began business around 1870. Stamps were issued from April, 1870 through July, 1874. 1,922,760 were issued on old paper and 634,410 on silk paper. The one shown was printed on experimental silk paper. Copies on this paper are more common than those on plain old paper, and far more common than ones on full silk paper. Griggs and Goodwill bought the factory and the stamp die from Hunt in 1873 or 1874. They altered the die to include their names at the left, and stamps were issued in black from March, 1874 through December of that year. 556,920 were issued on silk paper. 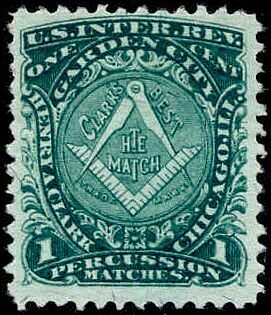 240,910 were then issued in green from December, 1874 until July, 1875, also on silk paper. Ransom, Clark and Company bought the factory from Griggs and Goodwill early in 1875, and did not change the die to include their name. They continued to use their predecessor's stamps but overprinted them with R., C. & Co as on the example shown above. 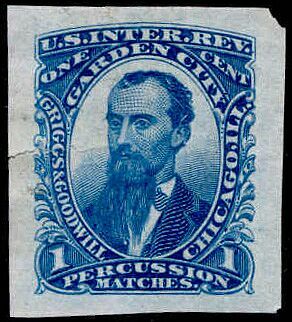 A trial color proof of the Griggs and Goodwill stamp on India paper. The next proprietor of the factory was Henry A. Clark, perhaps the Clark of Ransom, Clark and Company. He had the die changed to include his name and remove the central portrait, thereby rather improving the design. 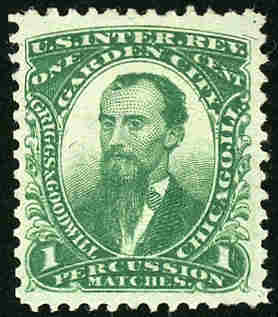 His company's stamps were issued from November of 1877 through February of 1878. 440,160 were printed, on silk paper. 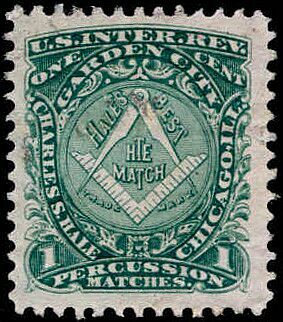 Finally, Charles S. Hale took over the company and had the stamp die altered to show his name. His first stamps were issued in December of 1877, so they overlapped those with the Clark name. Perhaps two brands of matches were being manufactured and it was thought useful to use two different stamps. 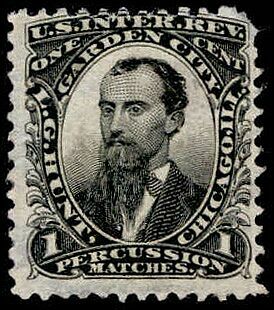 The Hale stamps were last issued in April of 1878. 330,000 were printed, all on pink paper. The quantities of stamps printed for the owners following Mr. Hunt were small, indicating that the factory was probably doing a marginal business.